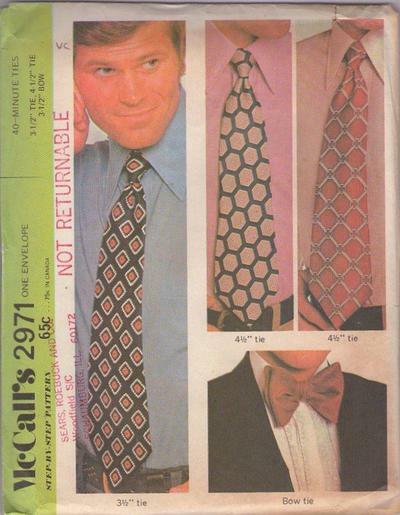 1971, 70s Menswear, Retro Accessory Clothing Patterns - Tie measurements (31/2” and 4 1/2" wide) are taken at widest part. Tie and facing are cut in one piece. Interfacing is the finished shape of tie. 31/2” Bow is interfaced, self faced, then sewn in place. Bow pattern is given in 14", 15", 16" and 17" neck sizes and closed with a hook and eye closure. If bow is velvet, ribbon neckband is used to avoid thickness under the collar.